My dream has finally become a reality. Tuesday is Taurus Dog Training's Dog of the Day! 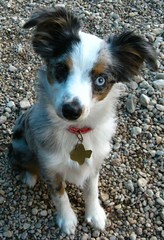 We’re happy to see this adorable Mini Aussie any day of the week! We can’t help but smile when she walks through the door at Taurus Lamar. She was a little unsure about the other pups when she first started coming in, but she gets more and more comfortable every time she comes in. Her confidence has already greatly improved, and she’s made lots of friends. Our techs also love to take a break to cuddle with this sweetie. SEE? I'm right. Next they will name Kaci Girlfriend of the Day and everyone will finally know what I know. So darn cute! Her see-balls are amazing! We just adopted a doberman and during the choosing process I kept looking at local shelters online and the dogs with two different colored eyes got my attention every time. So cute. It also makes me want to adopt a dog. Badly.